The place sets benchmark for Pizzas in town because of the consistency and authenticity. It’s always a big challenge to make people understand and educate about the Italian pizzas when Commercial Big Chains are around. But, the venture nailed and created a strong patron base within a Year. Well, I am talking about Brik Oven in Bangalore. It’s started by young and smart Chefs, Chef Anirudh Nopany and Sreeram Anvesh! Anirudh who trained under Le Cordon Bleu in London, which is one of the great culinary institutes! I guess this is the only place which created buzz through word of mouth more than Social Media. I was told that toppings are certainly not a matter from one of renowned chefs from Italy and I realized after having Pizzas at Brik Oven. The Pizzas over here are thin & soft inside and corners are thick and crispy. 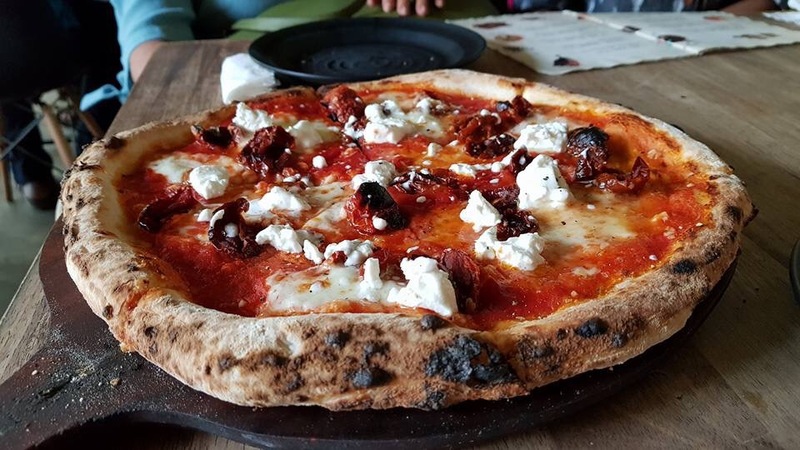 The dough kneaded using hand and baked in Wood fire Brick Oven. They import some of the ingredients to maintain the consistency. Also, they make sauces and kneading the dough freshly when there is an order for Pizzas. I happened to visit few times and did not find any difference with respect to quality of Pizzas which often made me to say “Brik Oven” whenever craves for Pizzas and someone asked for good pizza joints in Bangalore. During these visits I have tried multiple pizzas like Margerita, Smokey Marzano, Red Cotta, White Funghi and loved it. To be honest, toppings are certainly not a matter when we try pizzas at Brik Oven as I said before. The cheese garlic bread is soft and fresh with right amount of cheese. When I visited yesterday for lunch at Brik Oven, one of the pizzas was “Diovolo Veg”. Believe me, expression and love of pizzas came in the form of tears because of the super spicy bird eye chilies along with Wild Mushrooms, Baby Egg Plants, Feta Cheese and of course lot of love. I am sure; this is going to be a showstopper pizza for all the vegetarians. The ambiance of the 500 Sqft place is simple with open kitchen, wood fire oven, shelves, portraits and few tables with benches. Seems like, they focused more on the Pizzas and Milkshakes more than the décor. The service is prompt and quick. The prices are slightly on a higher side but, the taste will compensate it. Tip: 1. They will make half and half pizza. So, one can choose 2 different varieties in One Pizza. 2. The place is crowded all the time. Hence, reservation is Mandatory. I would suggest calling the restaurant once.